Welcome to the Queen Salon Community! The challenges of maintaining oneself as a Queen out in the world can be overwhelming. Given the very busy lives we lead as women, it is easy to forget who we are as Queens. Getting together regularly with a group of women – Sister Queens – serves not only as a reminder of what we have learned, it inspires and deepens our practice of what it is to truly BE a Queen and live as your BEST self. In these pages you can find out about Queen Salons®, locate one in your area, even learn how to start and lead a group! For you who choose to be trained as Salon Leaders, you also have access to special pages with extra resources and goodies to support you and your group. The Queen Salons are a key part of your journey in Being Your Best Self and in transforming lives one man, woman, and community at a time. Come, join us and explore…..
Kathryn Jaliman (Queen of Serenity, Grace, Beauty and Love) Kathryn has been a workshop leader at PAX Programs Incorporated for over 10 years, leading “Celebrating Men, Satisfying Women” (now “The Queen’s Code Workshop”), “Celebrating Women: Regarding Ecstasy and Power” (now “Queen’s Code for Life”), Queen tele-classes, and “Queen 2″ (now “Extreme Queen”). She co-created the “Extreme Queen” workshop and Doula program, and has coached, nurtured and supported new leaders as well as participants throughout her tenure. 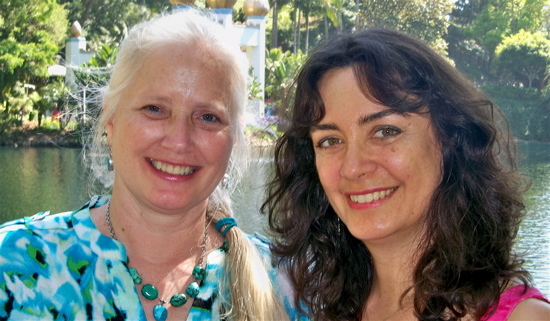 Kathryn also leads her own spirit-centered workshop, “The Queen Goddess”, through her company, Art of Life. By integrating other areas of expertise (spirituality and art) with her deep understanding of PAX principles, Kathryn provides a true sense of empowerment, collaboration and partnership to this program. She has been a supporter of the Queen Salons since early on, and believes they help keep the Queen’s Light shining out in the world. She is thrilled that the vision of a worldwide community of Queen Salons is happening now. For fun, Kathryn paints in her studio, visits art museums, sits on her back porch and communes with nature, and spends quality time with family and friends. She resides in upstate NY and has a BS in Education and a MA in Fine Arts. Fiona Nagle, PhD (Queen of Breath, Serenity, Groundedness, Contentment and Joy) Fiona founded the first Queen Salon group in 2010 and has developed a leadership style that balances masculine and feminine energy. Part of this style comes from her years directing nonprofits, where she specialized in visioning and strategic planning, and in creating and empowering local grassroots groups (like the Salons) to be really fun, effective, and transformational. The style also draws on her academic work, where she trained in leadership, conflict management, and group facilitation, and then developed a new model of authentic spaces for social change. Fiona’s company, Sustainable Visions, provides consulting services for businesses and organizations in the areas of authentic leadership and creative collaborative problem solving. Fiona did her first PAX workshop in 2008 and has since participated in most of the advanced trainings, including the PAX Mastery & Leadership program (now “PAX Mastery & Certification”). When not leading, she enjoys spending time with friends and family, reading Jane Austenish novels, geeking out with her Star Wars collection, hiking and camping in the local mountains, and dancing up a storm with salsa, swing, and blues. She lives in Los Angeles.